Ask RP Photonics for advice concerning different solid-state laser designs – for example, which type of design to use for a particular application. Most solid-state lasers are rod lasers, i.e. lasers with a rod-shaped doped laser crystal as the gain medium. Strictly, a rod always has a cylindrical shape, but the term is sometimes also used for crystals with rectangular shapes. Its ends are normally either perpendicular to the beam axis, or are Brewster-angled for suppressing parasitic reflections and ensuring a stable linear polarization. Rod lasers can be either end-pumped or side-pumped. Cooling is simplest for end pumping, where the outer surface can be fully surrounded by a water-cooled heat sink. However, there are also various options for side pumping. For a lamp-pumped laser, for example, a pump chamber as shown in Figure 1 can be used. Here, the rod is cooled with water, which transmits the pump radiation from the flash lamp or arc lamp. The rods used in such lasers are normally several centimeters long, corresponding to the length of the lamps, and have a low doping concentration. Obviously, there are some technical issues e.g. concerning how to exchange lamps or rods conveniently. 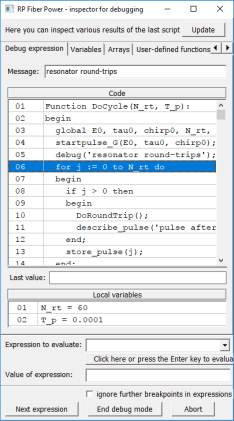 The laser resonator should be made so that most of the volume of the rod is filled by the lasing resonator modes. A rod with larger diameter helps to achieve better pump absorption, but may make it more difficult to obtain a good beam quality. Figure 2: Diode-pumped laser rod. 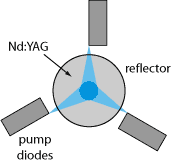 The radiation of three high-power diode lasers is injected through slits in a reflector around the Nd:YAG rod. Another possibility, used for some diode-pumped high-power lasers, is to inject pump light from laser diodes through slits in a reflector coating around the rod (Figure 2), and cool the outer surface of that reflector. A diffuse reflector helps to obtain a smoother pump intensity profile. By imaging the fluorescence from the pumped rod, the pump intensity profile can be monitored. An essential property of rod lasers is that the dissipated heat is dominantly extracted in directions perpendicular to the beam axis. An important consequence of this is that thermal lensing effects inevitably become strong for high output power levels. However, there are cryogenic lasers based on laser rods which can nevertheless deliver fairly high powers, mainly because the thermal conductivity of a solid-state medium is usually very high at cryogenic temperatures. There are also various techniques for mitigating the thermal effects in a laser rod. For example, it is possible to use composite laser crystals with undoped caps, or multi-segmented rods having sections with different doping levels in order to distribute the generated heat more smoothly. One or several rods can be used in a single laser resonator. With multiple rods, the laser gain is higher, allowing for a higher degree of output coupling; the intracavity power can be similar to that for a single-rod laser. The effects of thermally induced aberrations from the different rods do not necessarily add up; this is a matter of resonator design. An extreme case of a laser rod is that of a single-crystal fiber. Such fibers can be directly pulled from a melt, with no subsequent polishing except for the input and output end. They do not contain a waveguide structure for the laser light, but they guide the pump light, which is reflected at the air–glass interface. Among solid-state lasers, the most important alternatives to rod lasers are slab lasers and thin-disk lasers, apart from microchip lasers.